Dubai is a place of excess, and there is no denying that. In an odd display of wealth, however, the city has put together the most extravagant fleet of police cars ever seen. It all started in April 2013 with a Lamborghini Aventador, which carries a base price of nearly $400,000 and is limited to a production run of 4,000 units. For show, it’s a great car for the money, but Dubai’s police officials didn’t seem to be satisfied with just the one Lambo. Soon after, they purchased a Ferrari FF, which is another supercar that stands out, but is still not something to write home about in Dubai. Strange enough, though, the FF is to be driven only by female officers. Once Dubai had these two, it seems they decided it would worth it to add even more supercars to their fleet. Why, you ask? No one really know. But they are REALLY cool. The Bugatti Veyron has become a universal symbol of wealth and excess since its introduction in 2005. With only 450 cars produced, and a starting price of $1.7 million to $2.7 million, it’s a rare and expensive treat that few can afford. 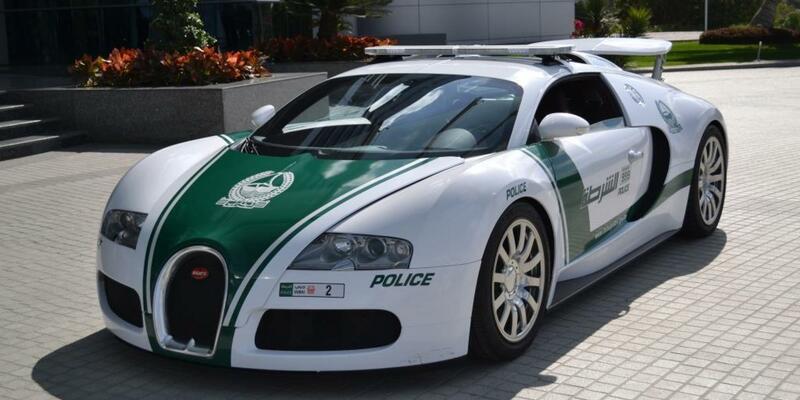 So for a police force looking to show off, the Veyron is the perfect car. With a production run limited to only 77 units, the One-77 is a much rarer vehicle than the Veyron, so it’s not a new car you’d see for sale in Sanford, FL. Still, it can’t beat the Veyron in terms of recognition. To be fair, though, it is still one of the best vehicles Dubai could have added to its impressive collection. While many see Lamborghini as a bland supercar, it’s also the car that tells the world you’ve arrived. For Dubai, this is the perfect symbol. It doesn’t hurt that the car is a 700 hp beast with a 0-60 time of 2.9 seconds. The MP4-12C is nowhere near as rare or exotic as the Veyron, One-77, or Aventador, it’s still an impressive vehicle nonetheless. What’s most impressive about the 12C is the fact that it was McLaren’s first production car it designed and developed all by itself since its legendary F1 production car. When up against a Mercedes-Benz SLS AMG, Audi R8, and Bentley Continental GT, many may call us crazy for choosing the Nissan GT-R for the fifth and final spot on this list. However, to defend the honor of NowCar, you have to understand that the GT-R isn’t nicknamed “Godzilla” for nothing. It’s a monstrously fast car, especially for one that starts under $100,000. Its 2.9-second 0-60 mph time and top speed of 191 mph will allow it to catch almost any other car that might run from it with ease.